For this month’s theme of ‘memory’, I spent quite some time deciding how to approach the piece as I didn’t want to depict people but find that the subject brings to my mind times, places and events involving family and friends. In the end I decided to back once again to a very special family holiday when we visited New York, and to use pictures taken at that time as the central design. 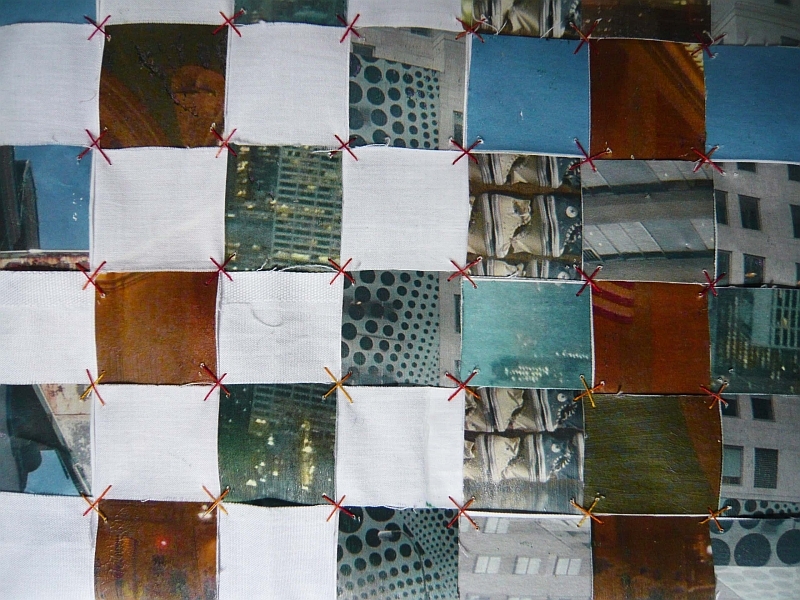 Since the city is set out in a grid pattern, I quickly decided to use a technique which incorporates a grid, and hit upon the idea of weaving strips which are only partly patterned. This means that there is a contrast between plain and ‘busy’ areas, that remind me of the views of rooftops and streets as seen from above. I sampled a number of ways of transferring my pictures to fabric, and while the samples worked fine, I found that when used on larger pictures the results were not what I wanted. So I bypassed that notion, and instead simply adhered the pictures to white cotton using gel medium. 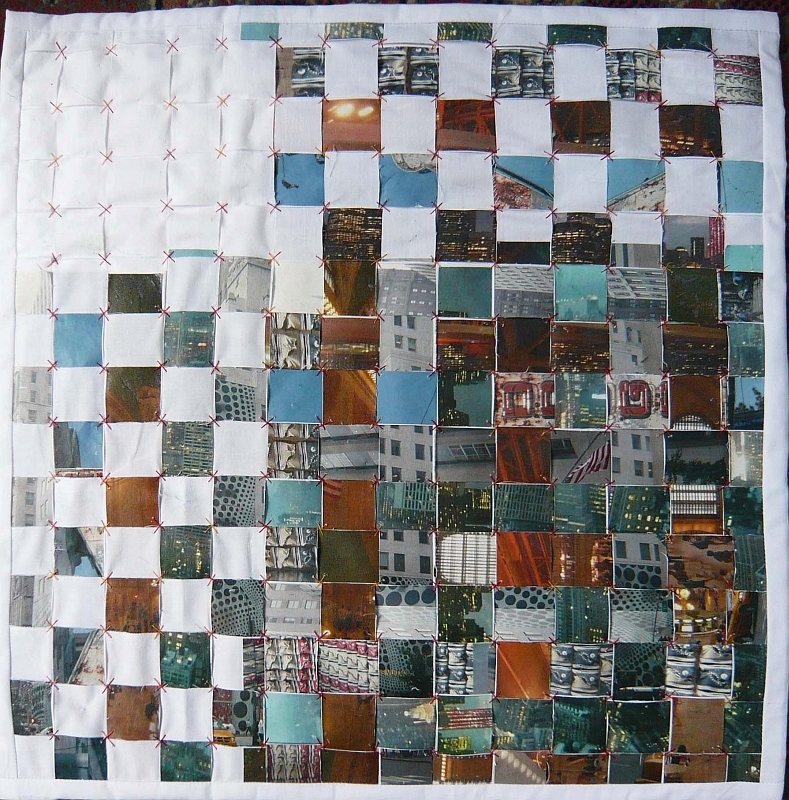 I used 12″ images on 15″ pieces of fabric, then cut each into 1″ strips for weaving. I adhered the woven strips to light-weight iron on Vilene to stabilise it, before adding the wadding and backing.The quilting is minimal and consists of simply cross stitches at each intersection of the strips. I wanted this to suggest the girders, scaffold, bridge supports, and other ‘hard’ architecture seen in a city-scape. What a unique and wonderful interpretation! I spent a summer (1969) in a suburb of NYC and visited Manhattan whenever I could. It was a magical time: Woodstock, the moon landing, the crowning of Charles, Prince of Wales…Your memories have brought back mine. Thank you!